Good comfort food when you are sick with the flu – cornbread and hot chicken soup. The staple in any Southern home is good cornbread. 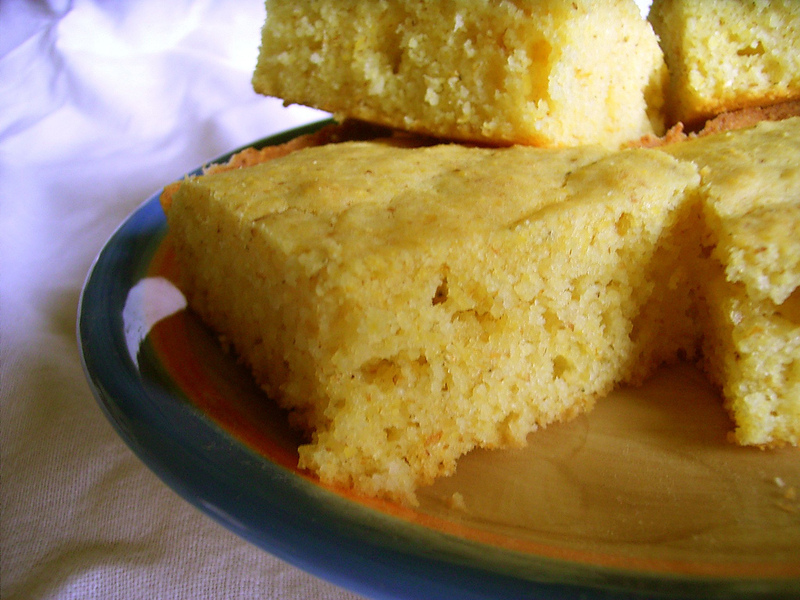 Here is one recipe for cornbread. Do you have other suggestions? Share them in comments below. Put first 5 ingredients in mixing bowl. (If it makes you feel better, go ahead and mix the dry ingredients, whisk the eggs into the buttermilk, then combine dry/wet ingredients). Mix with large spoon or whisk. Put bacon grease in well-seasoned 10-inch cast iron skillet over medium to high heat. Just as the bacon grease is about to start smoking, pour it into the other ingredients, stirring as you pour (if you can manage it). Leave enough in the skillet to coat the bottom and sides. Pour entire mixture into the skillet. Place skillet on middle rack of oven; bake until cornbread is springy in the middle, browned and pulling away from the skillet on the sides (about 15-20 minutes). Remove from oven and invert skillet over serving plate. If cornbread does not drop easily, you may need to run an icing spatula or even a flexible metal egg-turner around/under it so it comes loose. Recipe halves well, just remember you can’t cut the bacon grease by half because you still need to coat the skillet. Serve hot, with plenty of butter. Did people from Selma break the Ten Commandments of cornbread in 1870? The best meal is a true country dinner in the south – What are your favorite dishes? Have you ever heard of the Moon Pie drop in Alabama? So very true. I have seen some people use sweet milk and that is just nasty. You are suppose to use whole buttermilk; none of this 2% stuff. A tbsp of sugar helps it get crunchy brown on the bottom and it is not tasted. If you use any more sugar and flour it turns into yuppie cake and is baked in a aluminum pan….not edible. “A pinch of sugar to brown the cornbread.” Any more and it becomes yankee corncake. Matt, you know me so well…. Don’t was the Iron Skillet in Soapy Water. It will dry it out and make Cornbread stick. Washing a cast iron skillet with soap and water will make it rust. You have to season it again.. And then get it hot to prevent rust.. Some carpet bagger who’s parents or grandparents who moved to the south and mixed their Yankee ways with real southern living come up with that list. A few were right and the others are dead wrong. Mom was as southern girl as they come and she put a tad of sugar in hers. Sugar is a preservative and small amounts of sugar are often called for in older recipes for that reason alone, including recipes for cornbread. Most cornbread recipes call for no more than a tablespoon, which should not make cornbread sweet. My niece taught me how to make good cornbread. She is such a good cook. Yea, I’m talking about you Jeannie Middleton. My husband works up north and has to make his own cornbread because it’s like cake up there. It ain’t bad, but it ain’t cornbread. All purpose flour in the recipe? My husband would say “if it ain’t fried cornbread,it’s cake”! I like fried cornbread too. I don’t use buttermilk but I follow all the other rules for Southern Cornbread .Learned from my Mother who was from NE Alabama. Me too, I follow the recipe I was taught. Over the yrs. I’ve changed a few ingred. but it is still very good and never sticks. Love cornbread! From Ne Ala! Absolutely leave out the sugar, but also don’t put in an egg! I love sweet cornbread, and I bake it in cast aluminum! I made one a little while ago that looks exactly like the one in the picture.Same size black pan.Very good, it is. Just make it like mama did and enjoy it. My wife never used or needed a recipe. Her mother taught her and she taught her daughters. I will fail on number 8 ” Thou shalt not covet thy neighbors Cornbread ” Cornbread shall be white, not yellow and it shall not come out of a box. In a 10-inch cast iron skillet, add a tablespoon of shortening and preheat. Sift together dry ingredients; add buttermilk, egg, and drippings, mixing just until dry ingredients are moistened. Pour into the greased, hot skillet. Bake in preheated hot oven at 450 for 20-25 minutes. Have to disagree with no sugar. My Great Grandmother always put a few pinches of sugar in hers. Amazing. Here is a rule they missed. Cornbread should always be fried on both sides, not just one. Amen on the fried cornbread. Trea Newsome, you are a lady after my own heart. I had as soon be tied naked to the town clock as make a pone of cornbread using yellow cornmeal. SACRILEGE! ONLY white cornmeal, and never, EVER add sugar. Once a granule of sugar goes into the mixing bowl, it becomes cake! Also, I love how the photo below shows proper plating of a pone of Cornbread. Cornbread is RIGHT SIDE UP, once it is turned out of the skillet. Don’t be going and flipping it over, like my partner would prefer, for THEN it would be upside down…. And that is why southern cornbread is sooo nasty! You need to add sugar and then eat it with butter and honey! A tablespoon of sugar in cornbread, green, any veg. Don’t know why but all southern cooks do it and don’t talk about it. No we don’t all put sugar in cornbread or veggies.It would be cake like with sugar. I’m pushing 80, and no, mam, all Southern cooks do NOT. I once was trying to teach a young man from northen Ill to make cornbread. We had gone over the things i had written for him and then he had to ask what preheat the skillet mean’t ? i told him to just put it in the oven and heat it up; and in his own way; just how hot does it have be? I finall told him to heat it until just before the grease caught fire!! I totally agree with your wife. Guess we learned that from Grannie! Yes, and all of her daughter’s. Got to have the sizzle that bottom crust is the bomb in milk!!! Yes, Stan that is exactly how it is done. Trea, my mom made it that way, too. Your wife is right! My Daddy was a Colonel’ s cook in France during WW I, and later operated a restaurant or two. He was a superb cook, and always made fantastic cornbread. He always said, “No sugar in cornbread. When I want cake, I’ll make a cake.”. 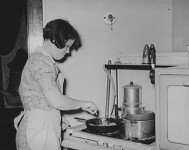 I make mine just like he did; I even use the same black iron skillet, which has never been washed. After use, I wipe it with a clean damp dishcloth. 450 degrees will kill any and all bacteria, by the way. That’s what my mama taught me too. Now your wife is a Southern cook, and I’ll bet she doesn’t let sugar come within a country mile of her cornbread. And ad a professional cornbread eater, I personally prefer a thinner cornbread over a thicket one. This is just me. 11th Commandment – Thou shalt always make enough cornbread to crumble into a glass and soak in your choice of either sweet milk or buttermilk for an after-supper snack. Makes me wanna shout….. Hold my mules while I get me some!!!! This is crazy. In every Southern house, there are receipts for cornbread, which that home’s cooks had put together over the years, for that family. My Southern roots got back over 350 years. Some of those learned cornbread by Native Americans. That is where it came from. Several years ago,my grandson was eating supper at a neighbor’s house. He asked the lady of the house, “Can I take some of this to my Paw Paw?” That was her cornbread. It was good. What was different? She cut up some onions, and put in it. There is not one family’s receipt. They are all different. Amen, and thanks to Aunt Minn that’s how I do it! My mil was a southern as they come (born in AL, the daughter and granddaughter of Alabamians). She always put a tablespoon of sugar in her cornbread. I had never heard of that before and I’m from the west coast. I have her handwritten recipe that was passed down from her grandmother! I’m a born Texan with Tallapoosa County, Alabama roots … I like a little sugar in my cornbread and will add jalapeño peppers to anything! I like a dash of red pepper. Joann Thompson, I thought you might like this too. Those are the true commandments as told to me by Carrie Bell. The addition of a scant amount of sugar ( I said SCANT) will cancel any bitterness from your baking powder. No more than 1 tablespoon. Somebody knew where their bread was buttered…. I remember my granny making ” water cornbread ” did anyone else’s? And adding dumplings to the beans to stretch them when extra folk showed up hungry. Also mom would drop dumplings in hers and add potatoes. As a preachers kid I remember all those ways of stretching food when extra folk would show up. It’s just not right to turn anyone away! 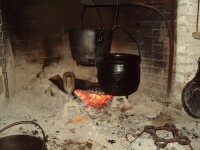 My granny would also use the water off of boiled potatoes to make gravy with for dinners, nothing quite so good! Dean, my mother made cornbread with water. It seems like it was just corn meal, a little flour(both self rising), and water. It made the thickest crust. I never learned to make it like that and regret it. My family had very little sugar on hand and it was always saved to sweeten things that were meant to be sweet. They did have sorghum that they made and that was always good on the finished corn bread. 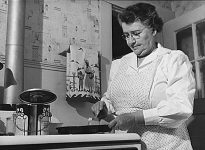 My maternal grandmother made cornbread in a skillet on top of the stove. She turned the pone once so it that was brown and crusty on both sides. It was tasty and good with soup. My paternal grandmother made it in a skillet in the oven………bacon grease and all. The grease was kept in a can on the stove top. Grandma Culberson probably made a pone of cornbread every day for 40 years (8 kids and a husband). She never seemed to stir the mixture more than a few “whips” of her spoon. The woman was an artist with cornmeal! I make it just like Grandma did. I fear the art may end with me as my 3 grandsons have not yet learned to appreciate this wonderful staple of southern life. Hopefully, there is still time. Its all good except ………..it needs……….thou shall ONLY use YELLOW corn meal in thy cornbread! Especially if you are a southerner! And I shall put not only jalapeños but also cheese when I want Mexican Southern Cornbread!!!!!!!!! I want my cornbread made only with YELLOW meal with flour added and jalopena and sometimes cheese. Guess there are 10,000 ways to make it but mine is the best. YUM. I used to make Mexican cornbread, and I used creamed or niblet corn in my cornbread with some chopped sweet peppers and chopped bits of jalapeño pepper too. Also shredded sharp cheese. Good stuff for a change once in awhile. Love old Southern cornbread too! My daddy made it every day using bacon grease.. He never added sugar though.. But used buttermilk! And I remember him eating cornbread and buttermilk with a piece of onion at night when he was hungry.. Great memories! Sounds right to me. Yankees sure don’t know button bout frozen cornbread. When I was in the Army and stationed in Massachusetts, I started dating my wife to be (Yes, a Yankee). Would spin the weekends at her families house. One week they ask me if they could cook at Southern dinner for me and ask what would it be. I said OK. Then told them it would be great to have a dinner with cornbread, blackpeas and turnip greens. Well to make a long story short what I got was blackeye peas, kale and Johnny bread. They didn’t put salt pork or bacon in anything and peas had not been cooked long enough. Kale was bitter and cornbread was flat. My wife to be learned from my mother how to cook it all later. Agree no sugar, Johnny cake is OK but as the name states it’s cake.. Followed recioe to a t and husband hated it. Sorry but I disagree about the sugar. And I make good cornbread. I tend to disagree with this. Hard Times Café has some of the best cornbread anywhere and I think they use sugar in their recipe. Just lets know when your on your way and I’ll have it waiting!!! Do u realize how much sugar u will consume in a year by putting sugar in your veggies, cornbread etc. that’s why so many people in the south are diabetic . MAKE IT TUPELO HONEY which is the best for cornbread. My mother had another commandment Don’t use your cornbread for anything else. I don’t put sugar in any vegetables. I am from the south and I still make my grandmothers cornbread which is 2 cups of yellow cornmeal and a half cup of flour, 1 egg and buttermilk to make it a little thick. Put bacon grease in cast iron skillet and heat on top of stove to make the crust crispy add grease to the mixture and then pour into skillet and bake at 50 till done. makes great southern cornbread . No sugar was added to hers . 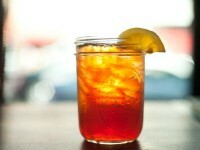 Terry Dillard, my favorite was to crumble hot cornbread into a large glass of cold buttermilk. Until I read your post, I was beginning to wonder if my family was the only ones who did that. 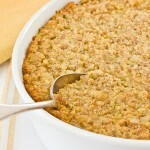 We also crumbled cornbread into our bean soup, potato soup and vegetable soup. Absolutely no sugar !! Cornbread crumbled into Chili and topped with shredded extra sharp cheddar and some finely chopped onions is also fantastic! Talk about comfort food on a cold winter night! Mmmmmmm, good! That’s how I like my chili. Grew up eating crackers with chili, and hated it that way. A dollop of sour cream, and a splash or two of Tabasco Chipotle hot sauce, or a little salsa atop that chili is good also. I grew up in Texas and it was a must to use “yellow cornmeal” and bacon grease in our cornbread whether it was baked in a cast iron skillet or a regular pan. When baked in a cast iron skillet be sure to preheat your pan and add a little bacon grease to the pan prior to baking for a pretty as well as crispy crust. I don’t think that I have ever seen cornbread with only “white cornmeal” in it. I married a man from St Louis, MO that loves my cornbread because as he says, “it has color and looks delicious”….. which it is. We also enjoy Mexican cornbread with yellow cornmeal, egg, baking powder, buttermilk, bacon grease, chopped pickled jalapenos without the seeds, yellow corn and chopped onions in it. The flavors are wonderful in both! Cornbread is a “MUST” in the South especially with pinto beans or butter beans with salt pork, a little garlic and served with “Buttermilk Pie”!! Thou shalt NOT addeth salt unto thy cornbread until it tasteth as the water in the ocean and render it near uneatable for all living things. As I was making a pone (pan) of cornbread to go with the leftover homemade soup that my wife made, the thought occurred to me that everyone may not have the good fortune to know how to make a fine pone of cornbread. So, for the first time, I measured the ingredients that I used so I could share them with y’all. Follow this recipe and you’ll be struggling to not eat the whole thing! I use a 10″ black iron skillet to make my cornbread, but if you don’t have a black iron skillet (gasp!!!) you can use a cake pan or other heavy pan, just don’t use anything non-stick. So, turn your oven on to 450 F. If you’re from Europe, or basically anywhere outside the United States, you probably use the metric system, so that will equate to 232 C. I like all you fer-inn-ers, but that’s the last metric conversion I’m giving you. The rest you’ll have to figger out on your own. You’ll also have to figger out what figger means. So, back to this world famou…. uh, in my mind famous recipe. With the oven heated to 450 degrees, a large dollop of bacon grease or 1/2 stick (4 tablespoons)… let’s just stop here for a minute. Someone who can barely cook, but has read 1000 recipes, is going to look at that and say, “He didn’t have to spell it out. Everybody knows that Tsp. or T. is the proper abbreviation for tablespoon.” Well, I know that, too. But, I also know that everybody doesn’t have time to order Chinese takeout or pizza and then spend the evening reading about the dishes they’ like to cook (but never do), and you probably don’t recognize the metric measurement of a “dollop”. So, just hold off on your snooty thoughts until you find out that the big funny-looking storage cabinet in the kitchen is actually called a stove. No, the other one You just looked at the dishwasher. Put that bacon grease or 1/2 stick of butter (yes, real unsalted butter) in the skillet and stick it on the middle or top rack of the oven so it can be melting while you assemble (yes, this is a project… or a puzzle to some of you) the rest of the ingredients. In a medium sized bowl (for those of you who eat take out all the time, this size bowl will hold about 4 Big Macs, or 3-1/2 Whoppers, or 1/2 gallon of Blue Bell icecream… I knew you’d recognize that one), mix one large egg with 1-1/2 cups buttermilk until the egg does some Kung-fu and becomes “one” with the buttermilk. Add a dollop of sour cream or mayonnaise (shut up, you ain’t tasted the finished product, yet) to the mixture and do the Kung-fu thingy again. Now, add 2 cups of Martha White or White Lily white cornmeal mix an Kung-fu it again. You mixture should be “pourable” like “just cooked grits”, but not too runny. Now, at this point you have a decision to make. Do I want to add cheddar cheese to my cornbread, or don’t I. Well Punk, what’s it gonna… oh, wait… that’s another movie. Anyhooooooo, if you like cheese it it, add about 1/2 to 3/4 cup. Now, remember that skillet in the oven that you forgot about that you’re now beginning to panic over? Well,if it’s bacon grease, it should be melted to a very thin consistecy similar to cooking oil. If it’s butter, it should be starting to turn a little brown around the edges. So grab (and this part is critical), grab a POT HOLDER. If you don’t know what that is, you’ll figger it out really quickly. And, you probably just figgered out what “figger” means. So, grab the pot holder and pour all but about a tablespoon of the grease/butter into the mixture. Stick the skillet back into the oven and then pull the “ole number 7”, uh… wait, wrong movie, again… so Kung-fu it all together. Now, pull out the skillet (remember what the pot holder is?) and pour in the mixture. You should see the bacon grease/butter moving out to the edges and up the side of the pan. That’s what makes that great crust. Now, put it in the oven for 14 minutes, or until it gets adequately browned on top. You’re looking for a golden-brown. You’ll need to start watching it when you get to about 12 minutes. Some ovens cook faster than others, so it may be done a little before 14 minutes passes, or a minute or two after. So, keep your eye on it. When it’s done, share the recipe with your friends. Just don’t laugh at them when they tell you that you could have abbreviated teaspoon. Born and raised in the South means you are required to know how to make the perfect cornbread. Jeff’s method will provide you with just that. Bacon grease is REQUIRED INGREDIENT if you want to be successful with your cornbread. I preheat my “cornbread pan” which is a 100 plus years old, perfectly seasoned cast iron cast iron skillet. That skillet was a wedding gift from my best friend who got it from her grandmother so it is treated with respect. In the 48 yrs I’ve had it, it never failed to cook my cornbread to perfection. Things that are no-no’s are sugar or exotic spices. Bacon is it’s own food group at my house so I always have some on hand. When I was growing up my Dad and I would have a glass of cold milk with cornbread crumbled up in it. Try it, I still enjoy eating it that way. Good Luck you Yankees. I am from Up North and I have to say I love cornbread with crumbles of flour, brown sugar and butter on top (just like a crisp). Every recipe has a story! My granny put a sprinkling of corn meal in the back grease in her skillet while it was heating on the stovetop. When the cornmeal starts to brown, then you add the batter. I always serve mine crust side up. Otherwise the cornbread steams on the plate, and you lose the crunchy crust. I never add any sugar to cornbread or vegetables. The only reason to add sugar to cornbread is if you need to hide the bitterness of old cornmeal. Hey y’all forgot to add cracklin’s to your batter. Cracklin Corn Bread is the only way to go. I’ve been reading all the way through the comments waiting for someone to mention good ole cracklin cornbread,I was beginnin to think nobody knew about that delicacy. Thank You. then to make it perfect, use only yellow corn meal!!!!!! The reason Southerners do not put sugar in their cornbread is because during the Civil War southerners did not have access to sugar. Heat the oil in the skillet, take the skillet out pour the batter over the oil and put back in the oven. Send me anywhere, but do not send me above the mason dixin line. Southern born and southern bread. Making up my Southern caviar right about now!!! Just got thru makin my black eyed peas, collard greens, and cornbread. In 22 more minutes we will eat ! Happy new year. Y’all have that down to a science. Southern eating. Just got through, Blackeyed peas, turnip greens, fried tatters, orka, onion& thin cornbread!umm umm good! Greens still cooking! Cornbread batter going in the cast iron skillet! So excited! Love New Year’s food! I wasnt thinking but i turned faucet on and,added to my cornbread while ago. I thought I have ruined ii. It rose so high and was great. We use to add a LITTLE water and it never hurt it. Already have that down! Tastes awesome every time! To me it’s more of what I eaten out west and will eat my (white) corn bread as I chose. But no sugar . EXACTLY! I like jiffy cornbread when I want something sweet. My recipe there! Absolutely no sugar! My mom always had good cornbread. She said the secret was using enough milk and of course a hot iron skillet with oil. I add a couple of table spoons of sugar to take the bitterness some corn meals have but not enough to make it sweet. Recently we started adding some creamed corn for a different taste. And we also like broccoli cornbread. no sugar, we southern, & yes hot iron skillet, that’s the magic! Just finished up, had turnip greens, hoppin’ john peas, fried taters, Mac n cheese, hot smoked sausage with kraut and cornbread and sliced onion!! That’s how we do it in Alabama!! Fried taters! YES…thank you. Think I will do that tonight with my famous buttermilk cornbread, fried pork chops, black eyed peas, fried okra and hopefully some collards. YUMMY! I’ll take a plate of everything except the greens and kraut. I guess not eating greens is why I’ve never had money. I don’t even know you and I wish I could have had dinner at your house. I just got through eating collard greens, black eyed peas, ham, cornbread, corn on the cob, macaroni salad, broiled salmon and banana pudding – – and now I’m craving smoked sausage with kraut, cornbread and turnip greens. I grew up in Alabama. Always missing home when I hear menus like yours. That’s good’ole down home southern cooking. I’m from Dothan, Al. My mother was born & raised there, met my dad at Fort Rucker, where she worked in the “Laundry Room”! I’ve always liked sweet cornbread. Sorry, but southern born and bred, still prefer my sweet cornbread, unless it has jalepenos in it. I’m from Texas. I have to have sugar in my cornbread. That’s what I do too!!!!! Thin cornbread cooked well done is so good. Can’t find any nosugar cornbread in Gainesville FL. It’s all sweeter than sweet cake here. I agree, NO sugar in cornbread. I put 1 teas of sugar for 1 cup of cornmeal. I add one teaspoon in my batch of about two cups cornmeal. I don’t like it too sweet, but I have to have that hint of sugar. They got the most important thing – No Sugar! Instead of immediately putting the skillet in the oven after pouring in the batter, I cook it for a few minutes on top of the top. Puts a great crispy crust on the pone. I do that also and I learned to add a heaping teaspoon full of dry cornmeal to the oil while it’s heating and the crust gets even crispier. Sounds good. I’ll try that. I love the crispy crust. My mother and grandmother both said that you need a thick iron skillet to cook good cornbread. All I know is their cornbread was the best. If I wanted sugar, I’d just make a cake. Hate sugar in my food unless it’s a dessert, I do like a little bacon grease in my cornbread. Getting ready to make a big pone of buttermilk cornbread to go with the baked ham, collard greens (seasoned with ham), scalloped potatoes and black eyed peas (also seasoned with ham). 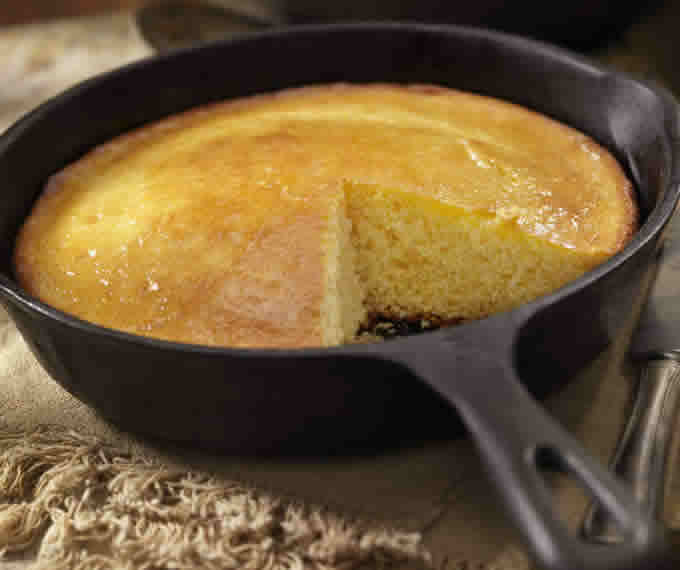 If it is not cooked in an iron skillet it is not cornbread especially if it has sugar in it. 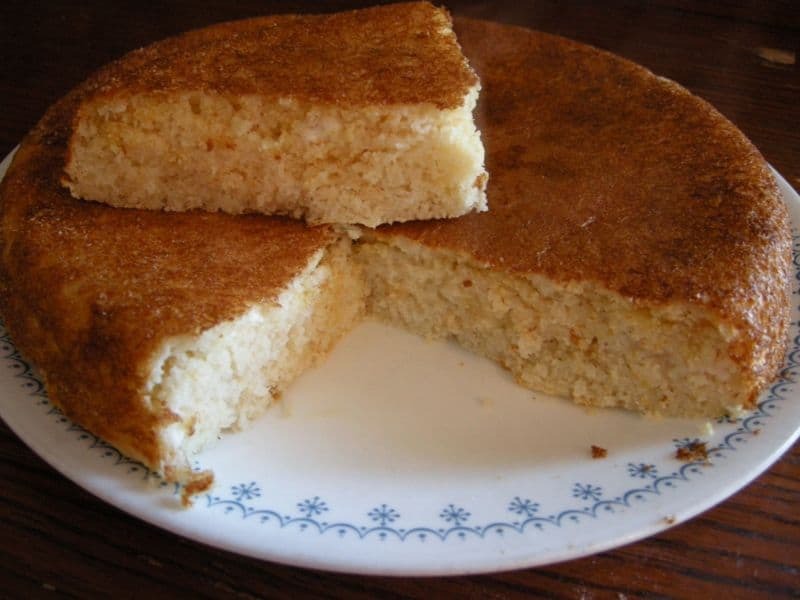 If it is not cooked in an iron skillet and has sugar in it you do not have cornbread, you have some form of cornmeal cake. Much better than the grit you all make! Just kidding! I like sugar but no eggs in mine. Best recipe is on the Martha White self-rising cornmeal package. Good and very simple. Plain all-purpose cornmeal works too. You just have to add the baking powder and baking soda. I like it made with buttermilk but you can use whole milk. My mother always sprinkled corn meal in bottom of skillet before putting batter in ,will brown cornmeal and makes a great crust ..Yum. .
had our peas, ham and greens, with buttered cornbread a few minutes ago! YUM! HAPPY NEW YEAR YA’ll! From Perry County Alabama! The only thing this type of cornbread should be used for is making dressing. Coming from a cornmeal family, true dinner cornbread is fried or baked pawn style (thin and crunchy). Cast iron skillet with oil, slices of bacon and hand drop cornmeal mixed with water and salt on top of bacon. Fingerprints left on top with another drizzle of oil. 425 for an hour. Golden brown and crunchy. The bacon pulls from the bottom as an extra treat! Amen. Don’t really need the eggs either, though. Yes! If God had intended cornbread to be sweet, He’d have called it cake! This is how to make cornbread. So easy, 3 bags sweet corn bread mix. 3 eggs , (1 can cream corn, one can drained sweet corn, a little milk maybe 1/2 cup, teaspoon salt, teaspoon suger, (grill some Conecuh County sausage, cut into 1/2 inch prices, 2/3 to 1 cup Mexican shredded cheese. Mix well add more milk (I use 1/2 & 1/2) if it’s needed. In a large black iron skillet melt butter 2 table spoons. Pour in the mix and turn the heat up. Let it cook for a minute, then put it into a 350 degree oven and watch it, 35 to 50 minutes, depending on your oven. When it done remove it and put two table spoons butter on top, cover with aluminum foil. Let it rest for 15 minutes. Then it would be “Johnny Cake”, Not cornbread!! That’s the way I learned from my mother! We had bread for Every meal when I was growing up! My mom made biscuits or cornbread, if it was to hot to bake, she would send one of us kids to the store to get a loaf of bread! Love it!! so right, i don’t know where these restrunants here in the south fine their cooks. I don’t like cornbread made with a lot of flour either. Cornmeal only. Cornbread doesn’t have sugar in it! So you know how to make cornbread,well bless your heart! My daughter will be making it for our Chili/cornbread classic cook off. I will be printing the ten commandments, just in case anyone why it is called ten commandment cornbread. Sugar is an abomination to cornbread. AMEN !!!! No sugar and MUST be baked in hot, cast iron skillet lightly greased with bacon grease. …. yummy ! And only REAL BUTTERMILK non of the low fat stuff!!! Photo is wrong! NEVER cut cornbread in the iron skillet, it damages the skillet. My mama would had a fit about that one. got the same scolding as a husband! Scrub when needed with a 3M pad and no soap! My wife can deal with the skillet, I don’t touch seasoned iron skillets around here. grease skillet with Crisco shortning. Shawnee’s Best cornmeal mix makes the best. Can’t get in Memphis, but we cold at PigglyWiggly in Sylacauga. Thanks for sharing. I agree to comments. This & soup heals. we had veggie soup an cornbread for supper .. The Northern people put sugar into n the recipe but I rather have the Southern recipe. It’s what I wanted when I had the flu for sure! Mix well pour into cast iron pre heated skillet greased well and bake in oven on 425 for 25 to 27 minuets. I use fresh ground cornmeal for my cornbread. I can make it as good as my grandmother taught me. It is fine. Butter makes it righteous. We just made a big pot of soup and skillet cornbread Friday! Yummm.